hello. sorry if this has been asked before, i have looked around but didnt found anything. Allies 1, Soviet 1, Epsilon 1, Allies 2, Soviet 2, Epsilon 2. In Act 2, start playing Foehn Origins after Machinehead. Co-op and Covert-Ops aren't necessary to the story, but they can provide some extra details if you want. Edited by Tathmesh, 27 March 2018 - 01:04 AM. 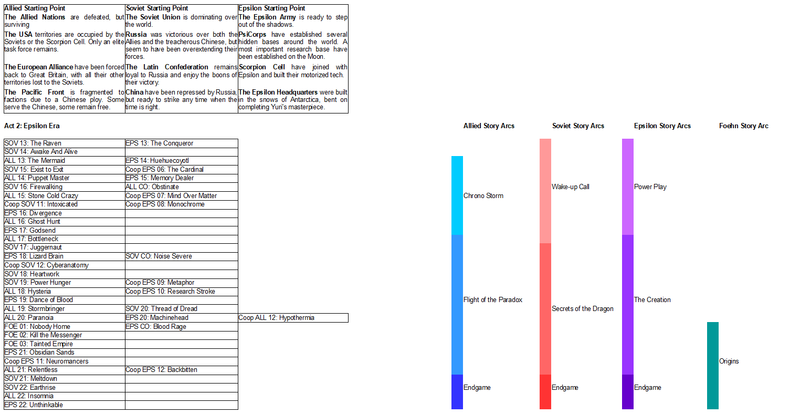 With a little research, I made a list for the missions of act 1 in the chronological order to play them, with the first being Peacekeeper, and the last being Moonlight. Unfortunately, I can't post it now, but in a few hours I will. 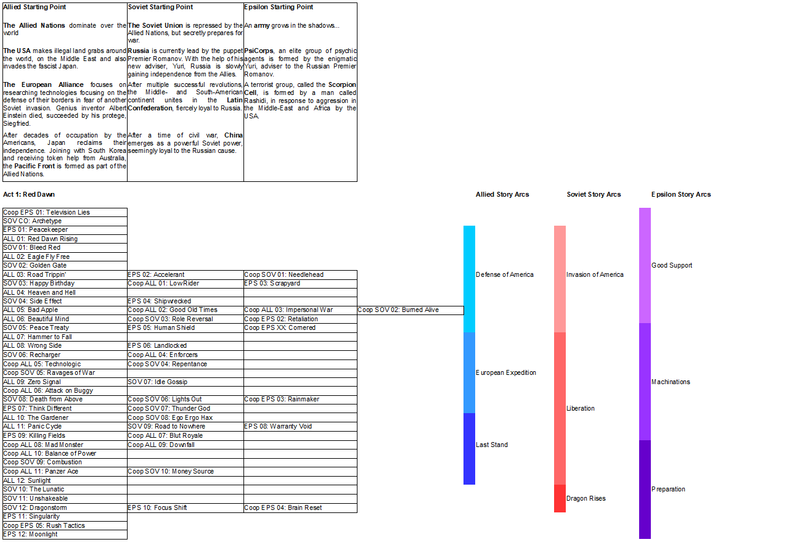 This was made using some previous lists and by reading the briefings. Some missions take place simultaneously, but the logical order of events would be the one I suggested. I made this list cuz I want to play the whole campaign on mental following this order, for things to make more sense lorewise. I think you're missing some missions. There are 12 x 3 = 36 missions in Act 1. Yeah, Road Trippin' and Scrapyard are missing from the list. The campaign wasn't designed with the intention to be played chronologically. You just do all the missions of a side in an Act, Act One before Act Two with the exception of Foehn Origins starting after Machinehead. Huh, that's interesting. So then is the story meant to be played one perspective at a time, or is it more of a gameplay reason? I think it's about playing from a perspective and seeing how things play out for them, then playing the other perspectives and putting the bits and pieces together to form the global narrative. It would be pretty silly to expect the player to finish a mission, load the next one but instead of actually playing it, have him go back to the selection screen and choose the one that's next in the chronological order. Edited by Solais, 27 March 2018 - 04:39 PM. Dang. I've been playing chronologically and really enjoying it. I was kind of hoping the final mission for each side in Act 2 (when released in a later patch) would have a real clear chronological indicator at the start or in the briefing, so I could keep it going without needing to spoil the end to figure out which to play first. Edited by RedFox34, 27 March 2018 - 05:27 PM. You shouldn't let what speeder said influence your playthrough. If you have fun playing like that, do it anyway. I'm starting a second playthrough now, on mental dificulty, and I thought it would be cool to play in the chronological order of the events, since on my first playthrough, the briefings were kind of confusing to me, having no ideea for example, who Yunru is, Stalin fist incident, etc. But, yeah, if it's your first playthrough, you should just complete all 12 missions for each side. 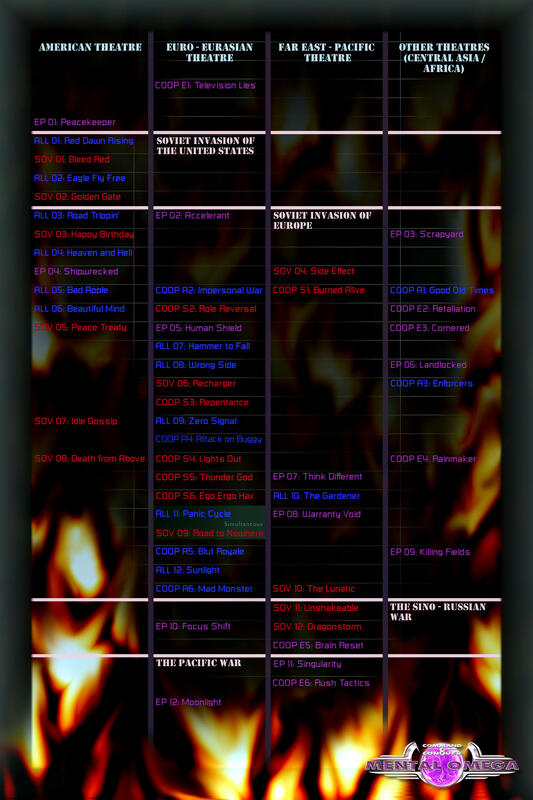 Alright, using the site's campaign section, the mission briefings, playthrough videos, loval's previous list and all that, I have constructed a new, hopefully accurate timeline of Mental Omega's campaign, including the the new coop missions included in 3.3. Obviously Act 2 is not yet complete. The chornology of the MO missions is like Red Alert Aftermath / Counterstrike missions. This is no strict order other than Allied 2 follows Allied 1, Allied 3 follows Allied 2. etc. There are some linkages between the campaigns tying different factions' campaigns together (like Soviet 9 Road to Nowhere and Allied 11 Panic Cycle), but this does not tie every mission. So long as you don't be intentionally abusive with spoilers (like, play the last mission first, because. ), you'll be fine. Edited by lovalmidas, 30 March 2018 - 10:54 AM.